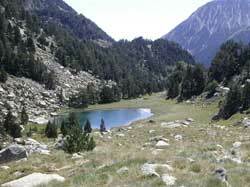 Aigüestortes i Estany de Sant Maurici is the only National Park in Catalonia. Physical Features The sub soil, formed of granite and slate, dates back to the Primary Era (Upper and Middle Devonian). Glacial terrain of Quaternary origin. There are as many as 200 lakes, all of glacial origin. There are also numerous rivers, brooks and waterfalls. 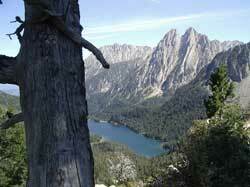 The climate is alpine with a mean annual rainfall of 900 to 1,300mm, according to the altitude (1,500-3,014m). Vegetation Characterized by woodlands. At lower and middle altitudes, silver fir Abies alba, is predominant and above this black mountain pine Pinus uncinata. The Scots pine Pinus silvestris grows in association with silver fir in lower shaded areas along with beech Fagus sylvatica, in the best areas of the lower zone. Birch Betula alba is abundant next to rivers and brooks. Other species include hazel Corulis avellana, ash Fraxinus excelsior, yew Taxus bacca, aspen Populus tremula, willow G. Salix and maple G. Acer. In the lower strata especially, thickets of box Buxus sempervivens, are found and many flowers which makes the park very colourful. Fauna Large mammals include wild boar Sus scrofa and chamois. Small mammals include edible dormouse Glis glis, Eurasian red squirrel Sciurus vulgaris, and mustelidae such as pine marten Martes martes, and ermine Mustela arminea. Among the avifauna, the golden eagle Aquila chrysaetus, is predominant in the high crags. The capercaille Tetrao urogallus, and the ptarmigan Lagopus mutus, are found in the woods. The rivers are inhabited by the common trout Salmo trutta. Management Constraints Problems exist because of the large number of hydro-electric schemes in the park’s lakes and lack of administration as well as adequate installations to receive visitors. Access to the western sector of the park is very difficult.